More to the point, I just wanted to inform and remind the lovely NGP readership of Steam's current promotion of Warhammer 40,000: Dawn of War II. The game's regular price of $49.99 has been slashed to $37.49 until Monday, April 20th. That's a savings of 25% on your digital download for a solid game that has only been out since February of 2009. Developed by Vancouver's own Relic Entertainment and published by THQ, Dawn of War II follows up on the popular original by putting a new twist on the RTS formula. The story campaign can be played solo or in co-op and it emphasizes squad tactics, combined with addictive loot gathering and leveling elements to create a unique action-RPG/strategy hybrid. The multiplayer mode returns to familiar RTS territory but opens up the options by allowing all races/factions to be playable. The full playable roster includes those lovable Orks, the mysterious Eldar and the vicious Tyranids. 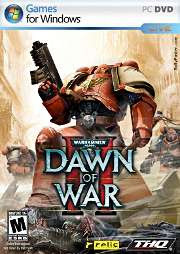 This may be the perfect time for RTS and Warhammer 40K fans to pull the trigger on this game. A demo is also available through Steam for those inclined to try before buying. It has made a mockery of my rather modest non-gaming laptop -- forcing me to dial down to the lowest quality of graphical detail -- but my short time with the demo was positive. If it didn't chug on my rig I'd definitely jump on this offer.